With three successful CicLAvias (Oct. 10, 2010; April 10, 2011; Oct. 9, 2011) under their belts, organizers are preparing for the next CicLAvia on Sunday, April 15. Ten miles of streets were car-free from 10 a.m. to 3 p.m. last time. This year, the initial route will be repeated, with new spurs to El Pueblo/Olvera Street and South L.A. for a total of ten miles. The downtown route will include First Street from Spring to Central; Central from First Street to Third Street; and Third Street past Alameda Street to Fourth Place and Fourth Street. There will be street closures in Little Tokyo, but cars will be able to cross on Los Angeles Street at First and on Second Street at Central. Billed as “L.A.’s biggest block party,” the family-friendly CicLAvia is designed to make the streets safe for people to walk, skate, play and ride a bike. There are activities along the route. Shop owners and restaurants are encouraged to open their doors to people along the CicLAvia. Ciclovías started in Bogotá, Colombia, over 30 years ago as a response to the congestion and pollution of city streets. Now they happen throughout Latin America and the United States. 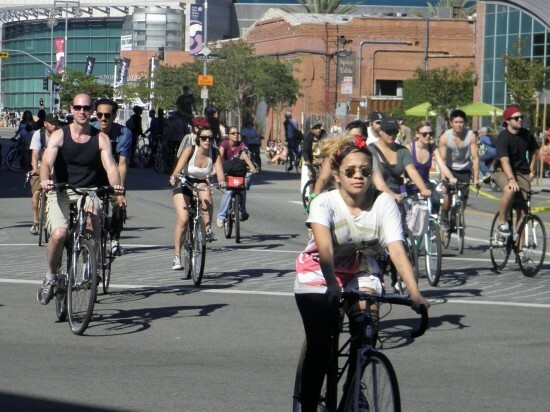 For more information, call (213) 365-0605, email [email protected] or visit www.ciclavia.org.